It’s funny (well not funny, more strange) how pain can be both physical and emotional. As someone suffering with depression and anxiety, a lot of the pain is emotional and therefore invisible to anyone else. But I don’t think it’s all emotional, sometimes when I feel really sad/down it almost feels like a physical pain inside. Like someone is crushing my heart, or someone has pumped lead into my body so everything feels so difficult and heavy. People who haven’t experienced this often don’t believe me, or cannot understand about this almost-physical pain, it’s so hard to explain, and even worse to have to feel it. I wish there was a magical cure for all of these problems we are suffering from. In fact, it doesn’t have to be magical, I’d settle for medication that worked! I’ve had a nightmare with my medications, and I’m still yet to find one that actually helps me, but I think I’ll write a post about that another day. Apparently it’s time for dinner, so I’m off for now. I am 19 now. Today I’m going to talk about birthdays. I don’t mean it’s my birthday today: it’s not – that’s in May. I was just thinking about birthdays, specifically the last 5. On an unrelated note, as it’s not my birthday I guess it’s my “unbirthday” – a very merry unbirthday to you. When I was 14 (and a half – ish), the ex and I were talking a lot. Rarely in person though. We liked each other but I was very very shy. We used to talk everyday on MSN for hours and hours. (This is relevant, I promise.) We argued (even then – I know, I should’ve seen the early signs that the relationship was doomed, but I didn’t at the time) and eventually he decided he had had enough of me. We stopped talking then. I tried to talk to him, but he ignored me. I remember my 15th birthday. It was probably about a week (maybe less, maybe more I’m not really sure) after we had ceased communication. My birthday was a Saturday, I think, (it could’ve been a Sunday but I don’t think it was) and I remember logging onto my computer, signing into MSN in the morning. On my birthday we had to go to Oxford for a family event. It was one of my cousin’s 21st birthdays, so we drove up to Oxford. I remember leaving my computer on until the last possible moment before we left. I remember seeing his name pop up in the corner of the screen when he had signed into MSN. I remember getting ready to go. I wore a black and white dress with a red belt that tied in a bow. I had matching red shoes and a red cardigan, and I borrowed a small white bag from my mum because I didn’t have a red or white bag. I remember standing in front of the mirror when I had put my dress on. This is the first time I remember looking in the mirror and crying. I cried because I wasn’t good enough. I cried because I wasn’t sure if the dress looked nice or not. I cried because it was my birthday but we were celebrating someone else’s, but most of all I cried because he didn’t speak to me. Not even on my birthday. Not even two words to say “Happy birthday”. It hurt, it really did. Because I was 15 and this was my first experience of how love hurts. We drove to Oxford. We went to a fancy hotel for a lovely meal. It was really nice. I remember that my nanna got confused, she said “It’s not your birthday is it?” I know it’s not her fault. She is relatively old; she gets confused, and she has quite a few grandchildren to keep up with. Especially birthdays in May: there’s 3 of us within 2 weeks. I had some friends round for a sleepover for my birthday party. I don’t really remember much of it. Except jumping on the trampoline with my friends. I don’t know why, but I remember what one of my friends was wearing; she was wearing a colourful skirt. She has since become someone I don’t speak to, because she betrayed my friendship. She’s just another one who’s hurt me. My friends made me a book for my birthday. It was amazing. It meant a lot to me. Only one of my friends knew about ex, and she knew I was upset about the whole situation. In the book there are lots of quotes, pictures, photos and messages. I still have it; it cheers me up when I feel down. Or it would do, if it didn’t remind me of skirt girl and cheese girl (another ex friend). But it shows me that I have (had?) friends that care. But the relevant part of this is that on one of the pages of the book, there were the song lyrics to Made up love song #43, this reminded me so much of ex (who obviously wasn’t ex at the time, more like boyfriend-to-be) because of the lines. I love you, I don’t think you care. Wow, I didn’t realise revisiting all of these memories would be so emotional. You learn something new everyday I guess. Then I remember ex phoning me to say he was at the bus stop. I went to the door to meet him (the bus stop is not far at all – about 30 seconds from my house) Then I remember him being angry. I had opened my presents before he got there. He was angry; he was horrible to me. I apologised; I said I didn’t know he wanted to be there when I opened them. I thought (but didn’t say) that it was more of a family thing. He made me feel stupid and guilty; “I got up early so I could get here before you opened your presents”. I think there was some kind of confrontation with him and my aunt. He left the house. I went upstairs and cried in my room. Not long afterwards, he came back. He came back panicking, I think maybe he was even crying. He found out that one of his friends had been stabbed and was in intensive care. He was going to be ok. I comforted him, he “forgave” me. He made the day about him. This sounds selfish because he was worried about a friend, but in retrospect he did make it about him (not me, or his friend). It was always about him. I don’t really remember my 17th birthday. I had an exam the next day: spanish. I had to revise on my birthday so I didn’t really celebrate it much. Ex always used to get angry if I spent time revising instead of with him. I got driving lessons for my birthday from my parents; learning to drive was fun. I really don’t remember anything else about my 17th birthday, it was uneventful. My 18th birthday was 16 days after ex split up with me. Needless to say, I wasn’t feeling great. We still went to the same college so I had to see him everyday. I don’t really remember the details but I remember us being in his car. I remember him being horrible to me; basically I remember that he ruined my birthday. I was going to have a proper party with quite a few people. Once we split up, I decided I only wanted my close friends. I invited about 12 people I think. Most of them didn’t come. I remember that less than half of the people I invited came. I think there were about 5 of us. It really hurt that my “best friends” couldn’t be bothered to come to my 18th birthday. Especially when they knew I had just split up with ex. Finally, I’ve finished talking about rubbish birthdays – phew. My 19th birthday was approaching and I was reallly worried. The last 4 had been rubbish, and my depression was pretty bad at this point anyway. I was at uni for my birthday; it was the first birthday away from home – that was weird. My boyfriend came up to Lancaster for my birthday. I had planned a big party because that’s what everyone does at uni, and everyone else wanted me to have one. The days before I was terrified: what if no one turns up? 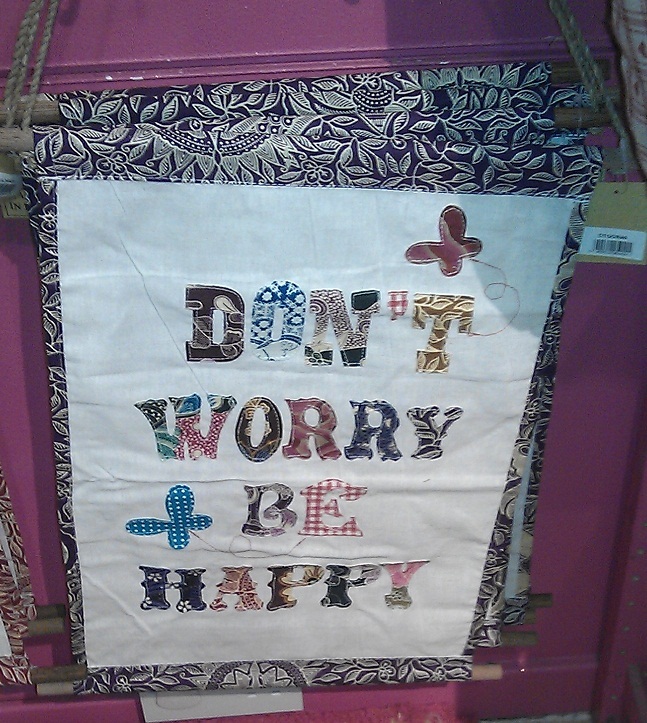 What if it’s rubbish? What if everyone hates it and then they will hate me? I really didn’t want the party to go ahead, but it had to, I couldn’t let people down. My birthday was on Thursday, and the party on Friday. I received a parcel in the post (mail) from my parents and brother. 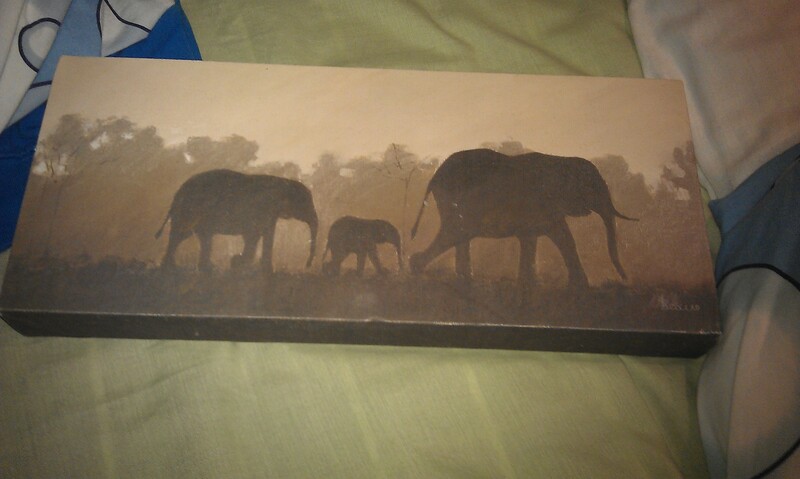 They sent me chocolate (Cadburys of course), sweets and some elephant related items. It was really nice! My boyfriend bought me an elephant shaped watering can. It’s bright pink – so cool! I will post a picture when I get it back (it’s in Lancaster, but I’m currently in London.) I spent most of the day with my boyfriend, and it was nice just relaxing and cuddling. I had a seminar (German grammar), and decided to go to it. When I arrived (slightly late,) someone was in the middle of their grammar presentation. However, he stopped his presentation to say happy birthday, followed by happy birthdays from most of the class. I blushed and hated it at the time – the attention makes me feel very uneasy, but I was glad too because it meant that people care. After that, my boyfriend and I went into town and went to the most LOVELY chinese restaurant. (Chinese is my favourite food) The inside was decorated in an oriental style (unsurprisingly), and there was a safe, intimate atmosphere. One of the waitresses (could’ve been the owner as she seemed to be telling others what to do) was dressed in traditional chinese clothing; made of silk and covered in beautiful embroidered patterns. It was a really nice evening, and the best birthday I had had in a long time! My party had a theme, it was “Noahs Ark”. So people had to come in pairs dressed as the same animal as their partner. I REALLY wanted to be an elephant (obviously!!) but I couldn’t find a grey dress. (There were other options which would’ve resulted in an elephant costume, but I wanted to look GOOD on my birthday) I found a really nice dress while searching for grey dresses, and it had a feather design on it. So I bought it, and me and boyfriend went as owls. I got to do our face paint which was fun! I am happy to say that the party went really well; I had fun, and I think everyone else did too. I even managed to make boyfriend have a good time, and he normally hates clubbing. If you have made it this far – wow thank you for being such a patient reader! I didn’t mean for this post to be so long, but once I started writing, I kept remembering more and more to put in. Anyway, the reason I decided to write about birthdays is because I wanted to prove (to myself more than anyone else) that the reason my 15th, 16th, 17th and 18th birthdays were so rubbish isn’t because of me, it’s because of ex. He managed to ruin every single one of those birthdays, and most of the years in between. This post may seem like a whining moaning post, and I’m sorry for that, but small things like this set of reminders for other deeper, more painful memories which I’m not going to talk about here (yet anyway). Today I went shopping with one of my best friends: ‘artist’. I can’t give her an animal name because she doesn’t have an obsession with any particular animal! (Unlike me or sheep) I shall call her artist because she is an art student, and likes art – that’s reasonable right? ANYWAY get to the point Elephant!! It’s a pretty cool shop, it’s run by a Buddhist charity, and they use Buddhist principles in their shops: ethical trading, giving a fair price for goods, supporting people in poverty etc. All profits from the shops go to their projects across the world including Bali, Guatemala and Kenya. While I was in there today I saw some signs with cool slogans on, so I thought I’d show you a couple of them. 🙂 I thought it would be nice to have another post to add to my ‘happy things’ category, and today is a good day. 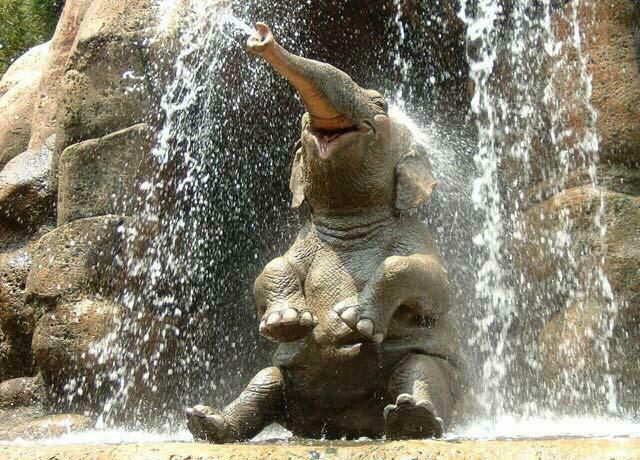 This very happy looking elephant was chosen by Maxi from me and anxiety so I have decided to make this picture, elephant of the week in her honour! Thanks for the lovely elephant picture! Sometimes when I’m feeling rough (as I have been lately), I forget about the beautiful things in life. I’ve decided to try and take more notice, because life is beautiful and the world is a beautiful place (you just have to look closely sometimes!) You may notice a new category: Happy things! I’m feeling pretty good today (compared to normal) so I thought I would start this new category. 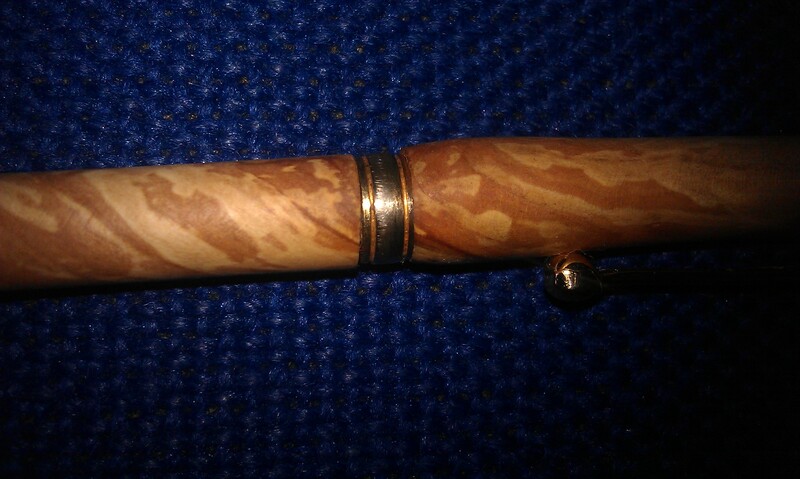 This pen was made by my mum’s friend’s dad. 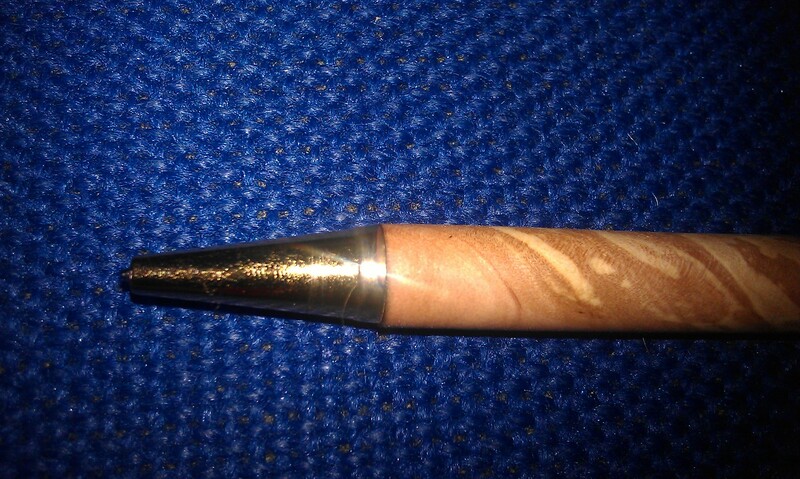 It’s made of wood, and as you can see it has a beautiful (natural) pattern. 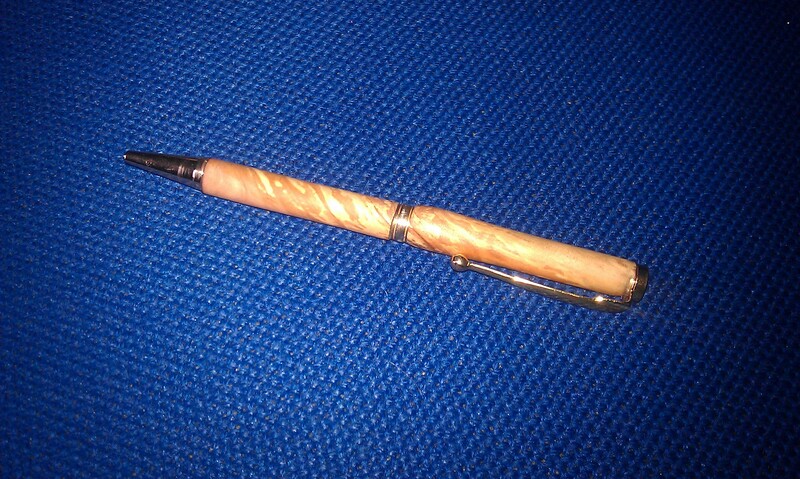 My parents and my brother all got given a pen too – all slightly different, all hand made. 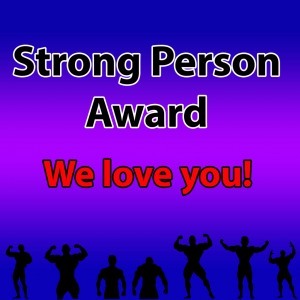 Always Allegoric has nominated me for the “strong person award”. I really appreciate this – thank you! 🙂 I am not feeling very strong at the moment, but I will keep going, and I hope everyone else here does too! You heard me right! You are not weak, you are strong. You are not a failure, you are a fighter! This goes out to all mentalists. And it’s a gift from me (The Quiet Borderline) to you all – Please spread the love. Mental health is not something to be sneered at and it deserves much more respect. Stop the stigmatising. 1. Make sure to add in the above text and image (above) to spread the love and add how little or how much you want! 2. Name your diagnoses – Stand loud and proud! You can tell us a little about them also if you’d like. 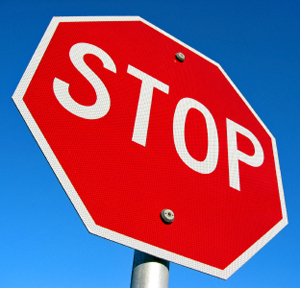 How you’re affected by these diagnoses and how you are fighting your way out of them. 3. Add a photo of yourself, or some abstract picture that represents you, anything you like! 4. Send this on to as many, yes, as many, people that you like. It can be five, ten, fifty. I suffer from depression and anxiety. I have these diagnoses from my GP, however I am still waiting to actually see a psychologist/psychiatrist who can hopefully help me. I think there is a possibility that my depression is actually something else, but don’t want to self-diagnose so I’ll wait until I see an expert! My depression has got to the point where I often feel very low, suicidal and generally rubbish. I am ALWAYS tired and I tend to ache a lot. I find it difficult to be around big groups of people, especially if I don’t know them, and crowds are HORRIBLE. I’ve had panic attacks in the past but (fingers crossed) they are quite rare now. I’ve tried numerous medications on different doses, and nothing so far has helped, but I will update my blog when this changes! I’m really finding writing this blog helpful, and want to thank all the lovely people I have “met” on here who give me hope! I’ve spent a while trying to decide what picture to use to represent me, but in the end I decided it HAS to be an elephant…what else could represent Anxious Elephant!! 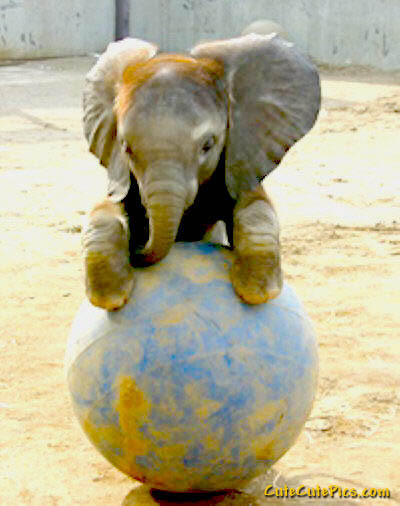 I chose this picture because it’s a small elephant (I am very small) and I think the ball kind of looks like the world, so can represent trying to overcome everything to succeed. Also, it’s just cute, and I’m a sucker for cute elephant pictures! I would like to nominate some of the blogs I follow, because I think they are very strong people, and I think their blogs are great. Forcing myself happy because her blog is great – full of ways to make you happy. 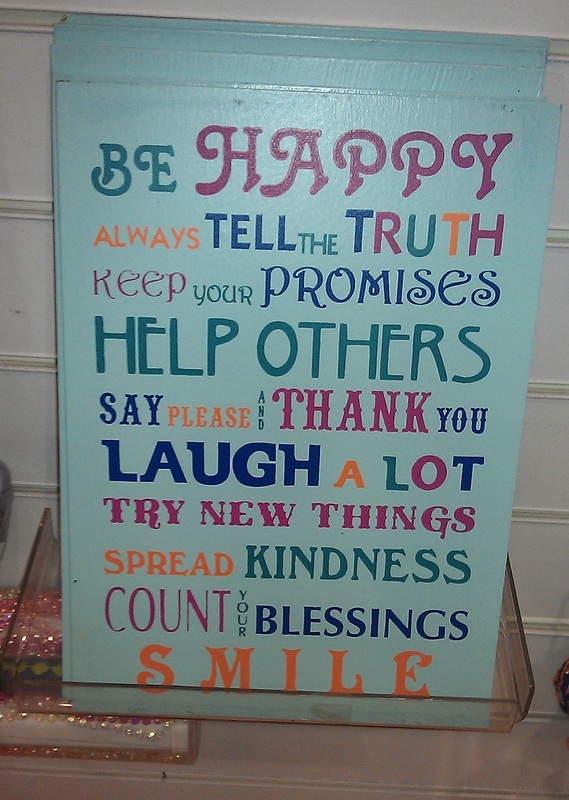 She is a strong person for conducting this happiness experiment! Having just posted a rantlike post, I thought I’d better do a post about being back. My laptop appears to have given up and died, so instead, I am now typing on…. *drum roll please*…. A lovely, shiny, beautiful new BLUE laptop! I have relieved to have a laptop back, although it was just a few days without it (it has been going wrong for AGES) I missed blogging! Also, some news – I got the courage to phone up Mind (as instructed by my lovely doctor), and have been booked in for an assessment sometime in September (they said they will send a letter). I was surprised (in a good way) at how easy it was to do. The lady on the phone was lovely, and didn’t seem to mind my nervousness, and someone called me back THE NEXT DAY to take more details and arrange an appointment. (The man who phoned the 2nd time was also lovely). So if you’re worried/nervous about calling Mind, I hope this will make you feel better about it! Well, I’m off to bed now I think – this is the first day I’ve been up for over 12 hours in quite a while! What have I done to be punished like this? What if I’m still not better? Depression is an illness. Sadly, a diagnosis don’t make it easier to treat, unlike with many illnesses. Different people respond differently to different treatments, and different doctors favour different treatment options. Basically, like it or not, you become a human guinea pig, an experiment – a “case”. When I am older, I really really want to try and help do something about this. Not just dealing with depression, but mental illneses in general. It doesn’t seem fair that just because our illnesses can seem invisible (on the surface), we don’t get proper treatment. I have learnt from personal experience, and from seeing other people’s treatment of mental illness that the area is still incredibly underrepresented, misunderstood and very very slow. Imagine if you were to go to the doctors with the flu. They are not going to say “What you need is antibiotics, I’ll try this one and if it doesn’t work we’ll try something else”, and they are also not going to say “We’ll put you on the waiting list for a year for your treatment.” No, this would be ridiculous! But somehow, it’s different with mental health. I know this isn’t fair; I know that resources are scarce, and that there are cuts all over the place. 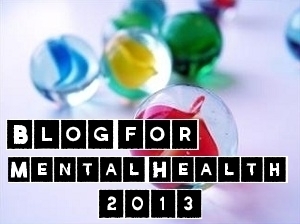 But I really feel that mental health is not something which can be (or should be) ignored. Unfortunately, my laptop has decided that now is the appropriate time to be uncooperative…in other words, it keeps crashing (blue screen is never good!). I’m hoping to get it fixed or get a new laptop soon, but won’t be blogging much until then sadly! This is also combined with the fact that I am feeling pretty rubbish at the moment, so am struggling to do anything,especially which requiresconcentration. Hope everyone is well, and I hopebot be back To blogging very soon. P.s. in case you were wondering, this post is written on an iPad,but it doesn’t seem to get on with WordPress very well,so won’t be posting much from here.